Please welcome our newest reviewer Angelo. We haven’t had a new addition to the team in a while and we look forward to many more insightful reviews. 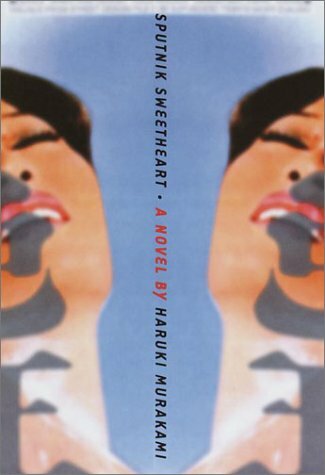 Sputnik Sweetheart (translated from the Japanese by Philip Gabriel) is the second Murakami novel I’ve read after Kafka on the Shore, which was my baptism of fire into Murakami’s perplexing world filled with unusual characters and dream-like events. And as it turned out,Sputnik Sweetheart hinges on the uncanny, and lonely. If I did not make up my mind to deal with the theme of loneliness like it’s my closest neighbor knocking at my door., however, I would have had a nervous breakdown out of empathizing with the characters. Sumire is an aspiring writer, who falls in love for the first time with, not a man, but another woman, Miu, Korean, seventeen years her senior. K, her close male friend who is infatuated with her, calls Miu her Sputnik Sweetheart. K, as the narrator, sees through what is happening to Sumire and Miu in the entire novel, and as such has a healthy sense of balance with the world and himself, his feelings, his philosophies. Miu, on the other hand, is poised and sophisticated, a businesswoman and knows French and Italian, is married but lonely. Sumire’s relationship with Miu intensified when she accepted the latter’s offer to work for her. On their trip to Europe, Sumire got lost (and in the end came back) leaving as clues two documents she wrote and hid, which K discovers and deciphers. The platonic relationship between K and Sumire makes it unbearably difficult for K whose feelings for Sumire never gets reciprocated. Sadly, Miu’s entrance into Sumire’s life slowly changed the seemingly misfitting Sumire, and her output as a writer waned. The entire novel is told from the point-of-view of K, but Murakami gave enough space for the two other characters. And, typical of him, Murakami meshes together disparate narratives that adds mystery to the entire novel. Just when the novel is about to end, that is when Sumire could not be found, K encounters a boy, his student, whose mother happens to be one of his girl friends, who steals things for no clear reason in the same way that Sumire gets lost and later comes back with no explanation for her disappearance. The question this novel makes me ask is: Is loneliness so scary that it has to be removed from life? I can remember the lonely times of my life as a child, but I barely recall the intensity as much as that of loneliness in the adult life. Upon reflecting, I realized that loneliness relies on one’s dependency on another individual, thinking that such a complimentary association makes us feel complete when in fact, it is when we are alone that we feel its power over us. We feel lonely when we do not get what we want from someone, another soul, undeniably a feeling so much stronger and longer-lasting than the loneliness we feel for things we can’t have. Sputnik Sweetheart is neither for the faint of heart nor for those looking out for a predictable story. It is for those who are brave enough to embrace their loneliness, and hoping to make sense of their lives whenever solitude confronts them.